A real bed & breakfast in the middle of the city, Le Rayon Vert offers three rooms in one of those typical Plateau houses, the iconic neighborhood of Montreal. The location, decoration, cleanliness of the place and impeccable welcoming make this a desirable place to stay at. Diane Bouchard transformed this hundred years old into a Bed & Breakfast by focussing on the decoration (high-end furniture and finishing) and comfort (free wifi). Diane serves excellent breakfasts in a dining room facing an inside court. 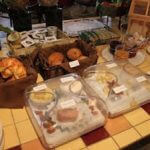 Your hostess will even offer to guide you through the city so that you can get off beaten tracks. Diane has many resources that she’ll gladly share with you as she’s always available to help you out. For those suffering from allergies, beware as you’ll be sharing the common areas of the room with the cat from the owner. 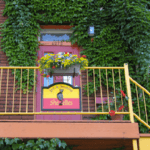 Le Rayon Vert Bed & Breakfast is located in the heart of the Plateau, the nicest neighborhood of Montreal, 2 minutes away from the Mont-Royal metro station and at a 20 minute walk from downtown.